I love Myrrh as a stand alone. I have some. Of course she was reading Rimbaud. please see my post today, it happened to me so suddenly too, from Olfactarama, by way of Helg at Perfume Shrine. That one! Dear Chris, you described myrrh so very well. I was very misguided as a child as to what myrrh would smell like - you see, I was born in Greece where orthodoxy is embedded in the culture and it is a very normal belief amongst people that the bodies and bones of saints smell of myrrh (in fact it is one of the 'indication' that a monk or priest that has passed away is indeed a saint). I always imagined myrrh to smell magical, sweet and otherwordly. Imagine my surprise when as an adult interested in perfumery I started acquiring myrrh essential oils from different sources to see what it really smelled like! Not what I expected at all, then :P Aside from the very salient medicinal quality you already mentioned, I find good myrrh also has a certain 'leathery' aspect to it. Divina, Thanks for the anecdotal info. Wow. Just leading a virtuous life is difficult enough, let alone making sure your bones, post-exit, smell of myrrh. LOL. I must get myself to Enfleurage on Bleecker St for a sampling of some good myrrh oils. Hm, you're tempting me to explore myrrh some more. I do indeed like opoponax, which is also called sweet myrrh, apparently, and have some essential oil. 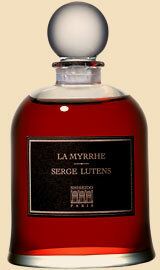 I'd like to try some myrrhs as well, and of course I need to try La Myrrhe as well! It may be that I've been reading too much fantasy lately, but my "La Myrrhe", "la" notwithstanding, is a gentleman. Not young, good-looking in an austere way, perhaps with shoulder-length, silver hair. An aging chevalier, soft-spoken, educated, polite, with something about him hinting at interesting layers of knowledge, personality and mysterious adventures to be explored and discovered, should he choose to converse with us. And he reads Verlaine. Or Catullus. In Latin, of course. What a lovely encounter with the Rimbaud reader (it *does* figure). Myrrh is handled so well here - not the usual invocation of the name and then attendant passing-off of the erstwhile exotic. Yes, Catullus most certainly comes to mind; the naughty and urbane blending into always almost (too) perfect recitative. As for the orange-y elements, yes, there's a fruit there with the slanting-light of orange blossom. The mahogany of the juice is masterful in and of itself.